A guide to repairing and restoring original features. Includes advice on windows, floors, beams and doors. One attraction of renovation projects is the charming original features they possess. But what do you do when they are in poor condition or missing altogether? Natasha Brinsmead explains. Without a doubt, the very best way to ruin your house is by getting the windows wrong — wrong materials, wrong proportions, wrong position, wrong furniture, wrong glazing. 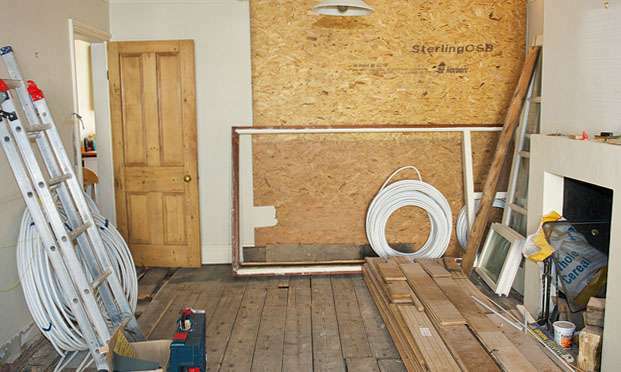 If you are renovating a house that has the original windows still in place – likely to be timber or metal – then do all you can to rescue them before you even consider replacing. Even if there is extensive damage, such as wet or dry rot, they can always be repaired — conservationists advise that, providing there is at least 50% of the original remaining, a window should be repaired. Houses with leaded lights are often listed and so will need to be repaired or replaced on a like-for-like basis. 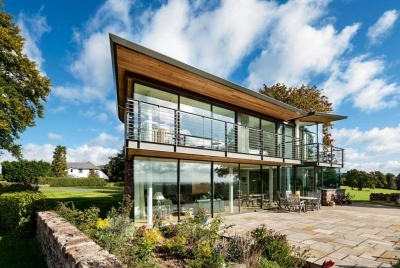 Common problems with metal windows include distorted frames, a build up of paint, failed latches and hinges, rust and cracked or missing panes of glass. Avoid replacing period windows with plastic versions — they will never look truly authentic in a period context. Draught and noise problems can be improved by fitting sashes with new seals and secondary glazing is also an option. Know This: Repairing windows will not require planning permission unless the house is listed or in a Conservation Area. Replacements must comply with Part L, which usually means double glazing. Single glazing may be permitted if you can make energy savings elsewhere. Repair or Replace? In some extreme cases the cost of repair work does not practically make sense and you may need to consider sympathetic, matching replacements. However, unless you are prepared to spend more, these replacements may not capture the fine detailing of the originals. In the case of sash windows, good-quality replacements cost between £700-£1,500 each. If noise is a problem, it is possible to replace individual sashes with double glazing. Timber floors are much sought after and if the house you are renovating has the original floor in place then you should consider restoring it. Other types of original flooring found in older properties include quarry tiles, flagstones and even brick — all can be restored. When it comes to timber flooring, you can either get a floor renovation specialist in to do the job for you, or carry it out on a DIY basis — it’s quite a common job. This task usually involves removing any existing adhesive and punching down exposed nails, nailing down loose boards and filling any large gaps. You will need to hire a drum floor sander and finally varnish the floor with a good-quality, hard-wearing varnish. If you have original quarry tiles or a stone floor that you have decided to keep, check to see what they have been laid on before carrying out any restoration work. This type of tile was often laid directly on to well-rammed earth. Most experts agree that if you want to keep the floor, leave it alone. Yes, the stone or tiles will be cold underfoot, but many people find that the earth underneath has dried out and although the temptation may be to add a plastic damp-proof membrane underneath the floor, this can often mean moisture is displaced to the base of previously dry adjacent walls. Likewise, sealing it can cause moisture to become trapped underneath. Basically, leaving it in its intended state is unlikely to cause problems. Many experts advise that the best course of action is to take the floor up, dig out the earth underneath, and insert a breathable insulated concrete mix, which maintains breathability. Costs? Floor restoration specialists will restore timber floors for around £35-50/m2. To hire a floor sander to do it yourself costs from £60 per week. Do not forget to factor in costs for good-quality varnish, which can be up to £100. Insulating Timber Floors: Insulated floors are much more comfortable to live with than those that are uninsulated. Suspended timber floors can be lifted and insulation fitted between the joists. You can choose between rigid polyurethane foam board insulation, cut to size, and resting on supporting nails or battens, or mineral wool, which is cheaper but a little less effective, supported on netting. Be careful not to block any airbricks under the floor as this can cause timber floors to rot. Period timber doors add solidity and charm to a property that is hard to beat — and if any of the original door furniture remains, all the better. Panel doors, common throughout the Georgian, Victorian and Edwardian eras, in various designs, were often shunned during the 1960s and boarding was often nailed over both sides, hiding the real door beneath, for a flush look. Discovering the originals underneath these boards is one of those moments that makes renovation so rewarding. If your doors are coated in years’ worth of gloss paint, they can be chemically dipped or sandblasted, with many specialists offering a collection and delivery service. This can cost from as little as £12 per door. The stripped door can then be waxed, varnished or painted as you wish. If the doors remain looking damaged or patchy, then applying a limed finish is a good idea and is actually a traditional finish for doors, floorboards and furniture. You can buy liming kits to do it yourself (around £27 from liberon.co.uk). Doors that have warped or have become rotten over time and are sticking in their frames can be repaired, usually for less than it would cost to replace. If the doors have been replaced – particularly common with front doors which are often replaced with unsuitable PVCu designs – reclamation yards usually have a good stock of all styles. Take your measurements along with you and be prepared to sift through quite a few. Most reclamation yards also offer a reconditioning service, at an extra cost. Most period houses will have a fireplace of some sort, whether it has been blocked up at one point, or has been replaced with a 1950s concrete design. If the fireplace has been blocked up, it can be reopened — a job which can be carried out by most competent DIYers. Once again, you should head to your local reclamation yard or search online for replacements. There are also many reproduction fireplaces available, some of which are very authentic in appearance, and these are generally cheaper than the originals. If the original is still in place, it may be partially boarded up, with only the mantle still visible, or it may have been painted many times over the years. These can be stripped and used to take your choice of fuel. Costs? A chimney should act as a kind of exhaust pipe for the house, taking away smoke, soot, gasses, hot ash etc. It is vital that you have any old fireplace swept before use, preferably by a member of the National Association of Chimney Sweeps, and regularly thereafter, particularly installing a gas fire. A sweep costs between £45-90. A: If you wish to use flues for open fires or appliances, they must first be swept, the condition of the lining confirmed and a smoke test carried out. Mortar or render typically wears with age. In addition, some old properties have timbers built into the chimney breast — meaning a chimney fire can spread into the main roof if parging is thin and worn. Your old flues will probably need relining. You will also need to ensure that the fireplaces have an adequate depth of hearth for whatever type of fire or appliance you want. The current Building Regulations set out the rules for new fireplaces; contact your local Building Control department for help. Plaster mouldings, including ceiling roses, cornice (the horizontal decorative strip between the wall and ceiling), picture rails etc., are much sought after features in period homes, but are often found with areas of damage, or sections missing. You might be able to find a match from a good specialist plasterwork company, such as Regency Mouldings (regency-mouldings.com), or Revival Decorative Mouldings (revivalplaster.co.uk), made from fibrous plaster. A good plasterer should be able to fit these for you and once painted they fit in well. However, if you are missing sections of highly decorative cornice, you might need to call in a specialist to ‘take a squeeze’ and create one to match, which will cost more, as with most bespoke services. There are many variations in the roof types found on period properties, with the most common including slates, clay tiles and thatch. Each requires a different method of restoration, but what all three do have in common is that any attempt to repair them using artificial replicas is usually disastrous. In the case of slates, any failure is most often caused by the corrosion of the nails holding them in place rather than the slates themselves, so this is the first area to investigate. However, slate can, over time, delaminate and become absorbent, in which case they will need to be replaced. There are many options when it comes to the replacement of slates, but avoid concrete or composite replicas. If cost is an issue, take a look at some of the recycled Welsh slates available. Once again, the message for those with clay roofs in need of attention is to avoid artificial replacements as they will stand out. In hard to see areas, you could consider machine made over handmade to cut costs. If the roof is thatched, it is always best to leave any repairs to the professionals. One of the biggest issues with a failed thatch roof is that any electrical circuits or wiring in the loft can be affected if water has been getting in — get them checked out. 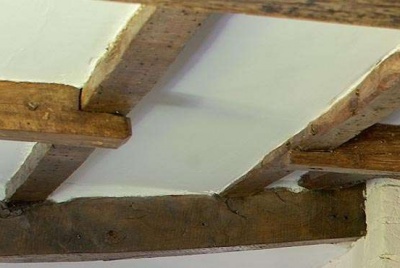 Nothing spells character quite as much as beams do in old houses — except for those painted in thick, dark, gloss paint, or half rotten away, which they often are. Even if there is evidence of beetle attack (such as woodworm or deathwatch beetle), it is very unlikely that this is still happening. Active beetle infestation is evidenced by fine dust which is left behind as beetles eat their way to the surface of the timber. Insecticides can be used to treat active woodworm. If the beams are structural and appear to have suffered from woodworm, or rot caused by damp, a structural engineer should be called in to assess the extent of the damage. Where beams have been painted, there are a couple of options. Blow lamps, grit blasting or grinding should be avoided on most old timber beams as they will destroy the timber’s surface. Sanding by hand is the gentlest option, but it is also a time-consuming and messy job. There are companies which specialise in stripping paint from beams using gentle methods, such as Protinus Ltd. (protinus.co.uk). You might also want to look into some of the primers which are designed to be applied directly onto gloss surfaces, leaving them ready for painting.